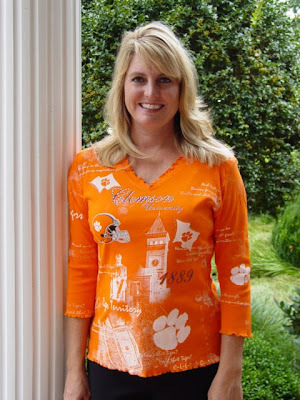 Clemson Girl: Don’t forget to visit the Game Day Divas this weekend – 50% off handbags and 20% off all apparel! Don’t forget to visit the Game Day Divas this weekend – 50% off handbags and 20% off all apparel! The Game Day Divas will be at two locations this weekend in Clemson – the first is their usual spot, in front of Tiger Town Tavern downtown with the big white tent (click here for a map), and the second, new location is directly in front of Flip Flops restaurant (used to be Explorers), across the street from Lot 1 near Fike at the end of Williamson Road (click here for a map). The second location is a perfect location for swinging by while you're tailgating or right before the game since it’s so close to the stadium. 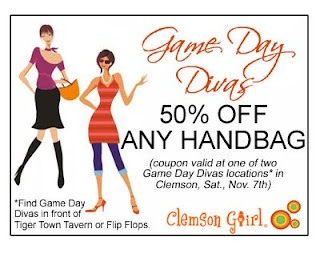 Game Day Divas will still give ClemsonGirl.com readers 50% off any of their handbags this weekend – you can get your discount by printing out the coupon below (click the image for a larger, printable version). They will also still honor their Halloween/Homecoming coupon from last week’s post. They have also cut the prices of their popular Landmark Shirts to only $20 (originally priced over $40) – these would also make great Christmas gifts this year. I’ve posted two examples below of the four Clemson options they sell. 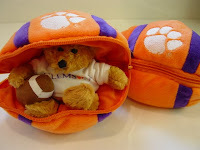 You’ll also find clearance prices on a lot of items that would make perfect gifts for your little Tiger fans. 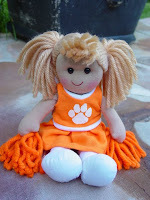 How cute is the cheerleader doll? 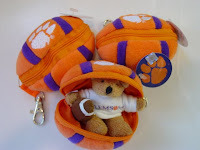 Do you have to be a little Clemson Girl to get one – I think I want one! And the stuffed footballs and mini-footballs make great stocking stuffers! So make sure you stop by and say hello to the Game Day Divas this weekend in Clemson! See everyone there!